From our Maine family farm to your family table, our Quarter Share gives you 85 pounds (170 pounds in a Side, 340 pounds in a Whole) of our amazing steaks, hearty and tasty roasts, and the best ground beef you've ever had. The perfect choice if you love great-tasting beef and want to eat healthier. Best of all, you'll know the farmer who raised the food you're serving your family. 100% Grass Fed and Grass Finished - Our cattle consume nothing but their mother's milk and the natural Maine grasses from our open pasture. In winter, they are fed hay, which is the grass we harvested and stored from our fields in the summer. Dry Aged for Two Weeks - We dry age our beef to achieve maximum tenderness and flavor. Family Farmer Raised - Our customers know the farmer who raised their beef. We're dedicated to producing great quality gourmet beef and to having a personal relationship with our customers and their families. Humane Treatment - Our cattle graze open pastures their entire lives and are never feedlot-confined. We have a rule around the cows: no yelling and no stress. We don’t use electric cattle prods. And our processor is less than 30 minutes away. No Antibiotics or Growth Hormones - Store-bought beef contains residues of antibiotics and growth hormones which are fed to feedlot cattle to keep them from getting sick on the corn they are eating. If one of our cows gets sick and requires antibiotics, the animal is removed from our herd and not sold to our customers. 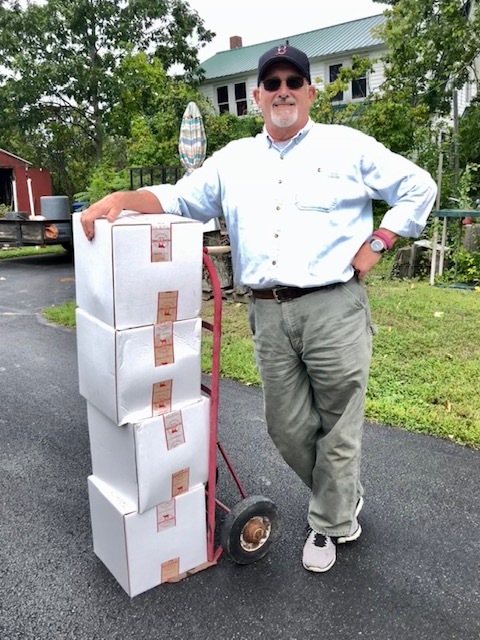 100% Grass Fed Dry Aged Heartstone Farm beef, hand trimmed to perfection by experienced butchers, packaged in freezer-ready, vacuum-sealed plastic, and flash frozen to stay fresh - and ready when you are. + How is the beef packaged? Our beef is packaged in vacuum-sealed cryovac and flash frozen. This insures it won’t get “freezer burn” and is same-day fresh when you thaw it. + How long will the beef last in the freezer? Your beef will be good for at least 12 months. We recommend avoiding storing for long periods in freezers which are opened many times a day. + What quantities is the beef packaged in? You receive convenient sized packaging in all of our cuts. Ground beef is in 1 lb packaging. Steaks like Porterhouse and T-bone are approx. 1 lb packages. Roasts are typically 2.5-3.5 lbs. Brisket is typically 3-4 lbs. + How is delivery arranged? We coordinate a time with you. Because we are trying to accomodate the schedules of many deliveries in one day, we do our best to find a time that will work. Some customers who can’t be home will have us leave their beef in a cool garage, or even put it in their freezer. If you’re away or can’t be home for an extended time, we will not deliver your beef that day. In some instances, we may use UPS to ship your order. If we do so, we insure you will be home that day and we use ice packs and insulated shipping boxes. We also insure our UPS shipments against spoilage. + How do I pay the balance? If you only pay a deposit when you place your order, we will bill you for your balance approximately 3 weeks before your delivery date. The balance is due at least 5 days before delivery. + Can I split my order with a friend or family member? Yes - and we will even divide up for you if you’d like. We do need to deliver it to one location per order however. +Can I customize what I receive? We try to accomodate special requests. For instance one customer each year asks for a Prime Rib roast which his family has for Christmas dinner. We gladly accomodate him - though his order does not have Ribeye steaks - which is where the roast comes from. Feel free to ask and we will try to help. .
+ What about soup bones and liver? Our share customers who like making broth or enjoy beef liver get either or both at no additional charge. + Is your beef organic? We are not “certified” organic but all of our practices are consistent with the requirements to be certified. It’s just a matter of the cost of the certification. + How much freezer space will I need? For a Quarter figure on 5 cubic feet. For a Side, you’ll need 10. And for a Whole figure on 20 cu ft.
+ Any tips on buying a freezer? Wait for the sales! Home Depot, Lowes and others have frequent sales and the prices are surprisingly reasonable. + CAN I SPLIT MY ORDER? We can split order for a Whole into two separate deliveries. + IS YOUR BEEF USDA INSPECTED? Yes it is. The slaughterhouse we work with has USDA inspectors on site at all times. QUANTITY OF BEEF: 85 lbs. FREEZER SPACE: 5 cu. ft. QUANTITY OF BEEF: 170 lbs. FREEZER SPACE: 10 cu. ft. QUANTITY OF BEEF: 340 lbs. FREEZER SPACE: 20 cu. ft.
FARMER DAN NOTE: We sell our shares based on the actual amount of beef you receive - not the “hanging weight.” Our customers have told us that “hanging weight” is confusing and not very transparent pricing. *Savings over buying individual cuts. 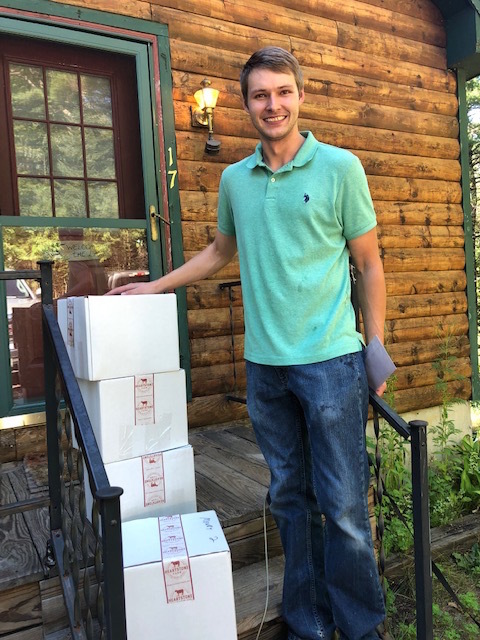 HOME DELIVERY ($29) In Maine, New Hampshire and Massachusetts (east of Framingham). For other areas, please contact us. ON-FARM PICKUP Enjoy a tour of the farm and pick up your meat at the same time to save the delivery charge.